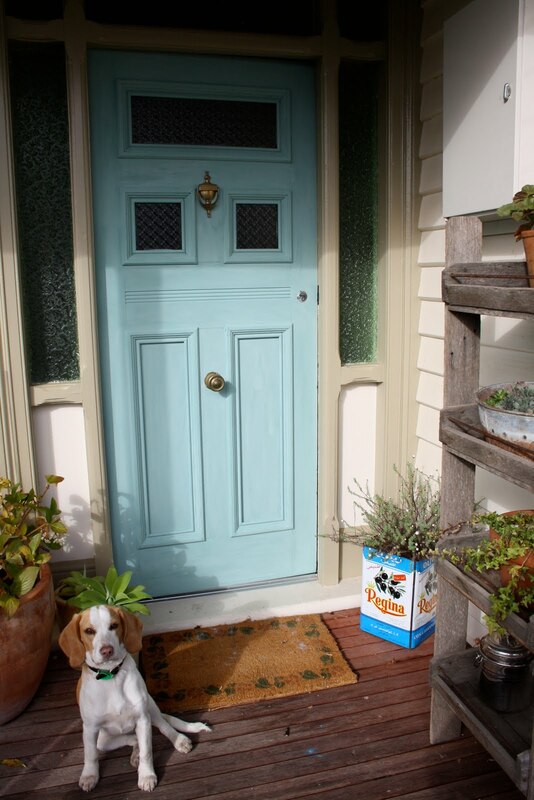 I have been wanting to paint the front door for ages but I thought I'd wait for the entire house to be repainted. A white house thank you. With a red front door. Or maybe a blue one, or green, or perhaps dark charcoal? Oh, too many choices. I'm not sure when the house will get its lick of white paint. But enough was enough. The fake tan brown door had to go. In the spirit of thriftiness and making do, I remembered a bag of milk paint I bought a few years back with good intentions to paint some baby furniture. Done. The decision made for me. This gorgeous paint comes as a powder that you mix with water. Made from milk by products, it creates a lovely chalky finish and is non toxic. BUT, is it suitable for north facing exterior doors? Err no. No matter, the brown has gone, it looks good for now and it will be interesting to see how it weathers. Thanks to Mabel, who bless her, patiently waited for liver treats while I took this shot. I L.O.V.E the colour, you have created a very welcoming entrance to your home. oh! wow i love that colour!! I've been flicking over paint swawtches for my dining room table and THAT is it! what shade is it? Hi Bianca - The colour is balmoral blue - a porters milk paint but it was discontinued when I bought it I'm afraid! Love it- much better than brown! Mabel has grown so much, and so well behaved! Amazing what they'll do for liver treats!Nigella retrained my mother, every time she goes outside she got a treat. Now Nigella rushes to the door walks out and comes straight back in- works every time! Love the pale blue... for a moment I thought you were going to say that you were intending to paint over that heavenly blue.... But no that is the end result .... Hooray!! It looks great. And, oh Mabel, what a good girl! It's absolutely gorgeous. Love the colour...very fresh!!!! I do like the idea of a red door as well though!!!! Beautiful colour. I hope it lasts a while at least. that colour of paint is amazing! i have been checking out porters paints- they seem great!